Hello friends! Before I get started with today’s DIY (which I made like a month ago, but ya know, life), I wanted to give y’all a little recap of my last few posts & happenings in case you missed anything!! This semester I’m taking 16 credit hours and I started my first research assistant position this week, in addition to being a new member leader in my sorority, in addition to opening my own Etsy store just recently, so things are crazy to say the least. I’m making an effort to post more on my blog, and hopefully I’ll be able to pre-write some posts to have things ready ahead of time for when things get mega-busy! Now, let’s get into this DIY! Cira-16-year-old-Kristen was super crafty and I spent one whole summer early in high school crafting a bunch of things for my bedroom. 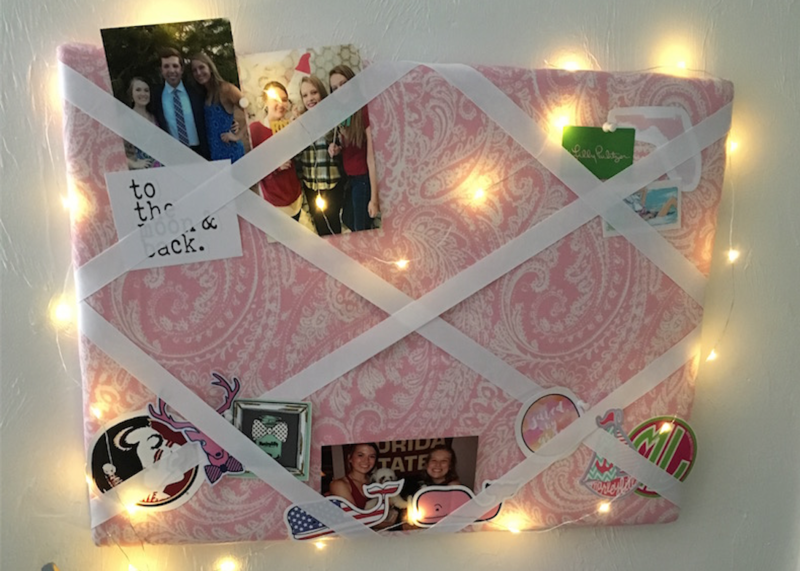 I made a similar memory board from an old bulletin board back then but now that I’ve moved to a house at college, I wanted to make another one! This memory board is easy and so cute! I didn’t even use any instructions when I made it this time, and I love how it turned out. This DIY is the perfect up-cycle for an old cork board, or an easy way to dress up a boring new one! 1. Lay out your batting under the cork board. 2. Cut your batting so there’s enough around the edges to staple it to the back of the board. Nice! 3. Cut your fabric to the same size as the batting. 4. Before we start stapling the batting and fabric to the back of the board, it’s important to pay special attention to these holes on mine for wall mounting, and to the corners. Once stapled, I cut around the holes so they’d be open to hang up the board. Also, you can cut out a lot of the bulk of the batting around the corners, so you don’t have as much material to fold over. You can cut out even more than seen in the picture. Just experiment with the first corner and see what works! 5. Start folding over the fabric and batting around the back of the board, and start stapling! I started on the middle of each side, and then put staples 3-4 inches apart down the side. I also kept to stapling to the sturdier frame around the board, instead of to the softer cork-part itself. Once you have one side attached, it’ll be a lot easier to get the other sides taunt. 6. Once you’ve finished two adjacent sides, the corners can be a little tricky. I just tried folding the corner fabric like a present. It took a couple tries of cutting out extra batting to get it where I could get the staple to hold. 7. Here’s 3 finished sides, and two corners. 8. All stapled! Once I finished all four sides and corners, I cut out the material around the mounting holes, as shown earlier. Now we can start on the ribbon. 9. Flip your board over, right side up now, and we’ll start laying out the ribbon strips that’ll hold your cute things onto the board! 10. I started by laying out the two longest strips. For these, I measured from corner to corner and left enough extra to wrap around the back, just like I did with the fabric and batting. I wrapped the ribbons around the flat part near the corner, instead of trying to wrap it over the corner point itself. 11. Then I measured out the smaller cross-ribbons. You’ll need 4 of these the same length. I measured from the middle of two adjacent sides, again with enough to wrap around. 13. Now, I laid out the ribbons on counter and put the board face down again, to start attaching the ribbons. I started with the longest two, and then measured to the middle for the shorter pieces. Once you attach one end of the ribbon, be sure to pull it tight before securing the other end. 14. Here’s what the back looked like with all the ribbons stapled. You can trim the excess past the staples. 16. Finally, hang up your board (I used the wall anchors and screws that came with this one, but I just rested my old board against the wall of my desk, no tools necessary!) and decorate! I added these battery-powered fairy lights from Target as well. If you try out this DIY, be sure to leave me a comment and send me a finished photo! So cute! Love that you made your own instead of just buying one of those at the store! Thanks, Rebecca! I love making things myself when I can to save a little money & make something really personal to me! I loved this! It’s so pretty and very simple. Thanks for sharing! Thanks, Mimi! I think the lights are a super cute touch too. Honestly, I just added them for the picture, but ended up leaving them because I love how they look! You’re so crafty! Excellent tutorial! I love memory boards but I never knew how to make one. This is a great tutorial! Thank you! I’m so happy to help then, Gabriella! With the right supplies, it’s actually pretty simple, but I definitely stuck by my tutorial the first time!